This is probably my favourite cafe in Delhi. When ever I can't seem to decide what to eat I end up at Latitude. But, wow have I had a roller coaster ride with this one. I used to find it highly inconsistent. I have had some awful meals here, but yes some good ones too. The service was another level of bad, having almost lost my head full of hair here with their frustratingly complacent staff and management. Why did I still keep returning? Well have you been there? Its utterly charming and it got me bad. Its the perfect lunch spot, as long as they were having a good day. And from my last few recent trips I would like to report that not only has their service improved a lot. But the food has finally been consistently good. Its tastefully done, in true Good Earth fashion. Set on the top floor of the store, after you strategically go through all the Good Earth wares on display. They have an outdoor space with sunlight filtering in from all sides but without the noise, pollution or heat of the outdoors. How you ask? Well its covered in glass all around, so even though you feel like you are sitting outside you are actually in a small little glasshouse. *Sigh* . Its really quite cute. 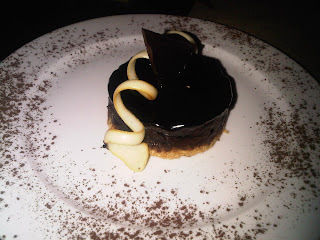 Again a Ritu Dalmia collaboration, she designs and manages the menu. Goat Cheese Tart - Good, and yes I eat this everywhere i go!. 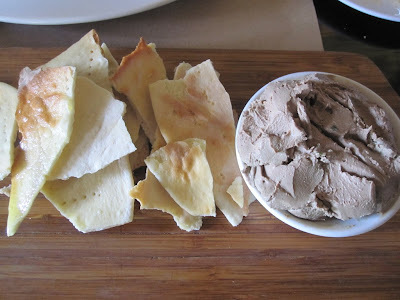 Chicken Liver Pate w/ Pita Crisps - Yummy! I can eat endless amounts of pate. Not the best in the world or anything but it still makes me happy. 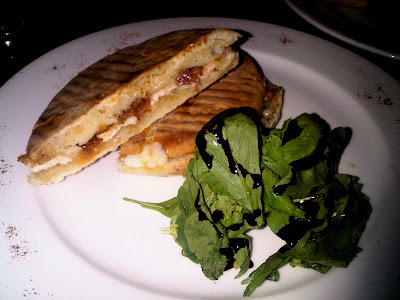 Bruschetta - They have a variety, the regular tomato basil is pretty good, so is the brie with caramelized onions. 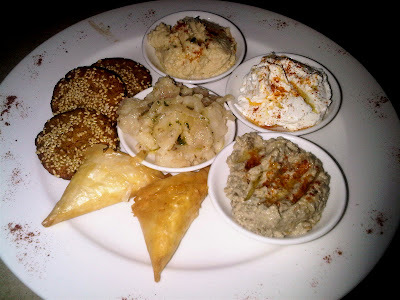 Middle Eastern Platter, includes: Tzatziki, Baba Ganoush, Hummus, Felafel, Feta Cheese Triangles, Side of Pita Bread - I wouldn't mind this as a starter because somethings were good but not all to make it worth a main. 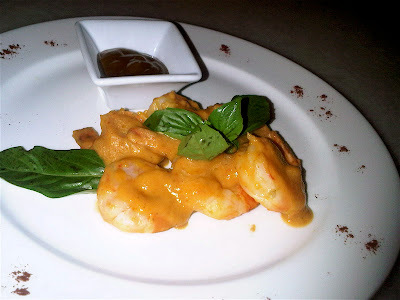 Sambal Prawns Rubbed Prawn Skewers w/ Sweet Mango Chutney - I like the sweet mango chutney. 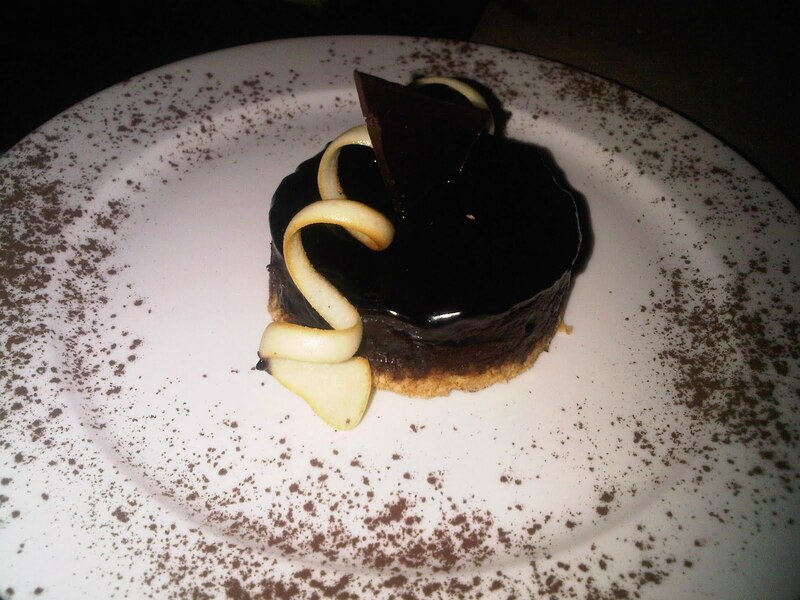 But overall its nothing too great but neither would you mind eating it. Duck Rolls w/ Hoisin - Not bad. Finely diced duck, with slightly sweet flavours of five spice, wrapped and fried in a wanton wrapper. There couldn't be a better accompanying sauce than hoisin in this case. Vietnamese Spring Rolls - Sliced fresh vegetables wrapped in rice paper served with a sweet Thai chilly sauce. Quite refreshing. Shredded Zucchini and Feta Cheesecakes w/ Tzatziki - So I have fallen for this twice thinking it was these zucchini and feta fritters they used to have on their menu before which were divine. Yes, yes I know it says cheesecakes but I stop paying attention after the first four words. This however is probably one of the worst things on their menu. It tastes like some malai mithai type concoction. 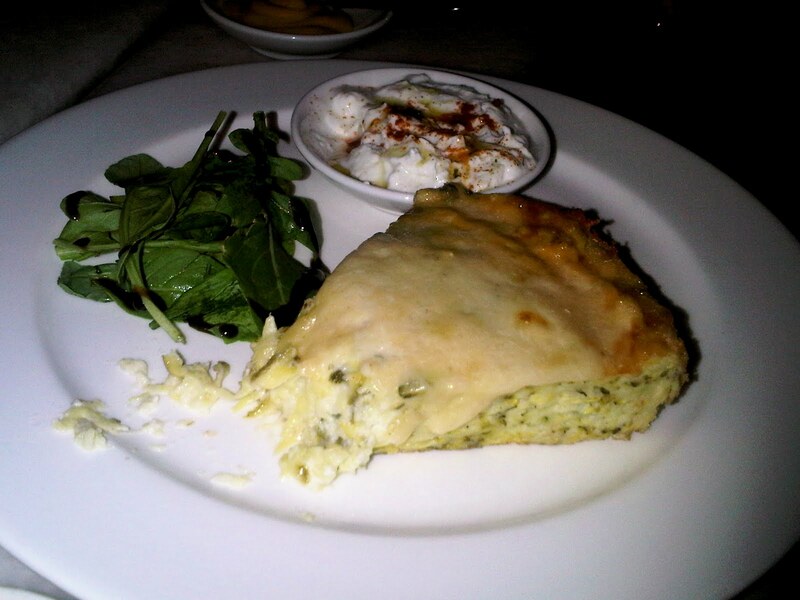 And we're talking about a savoury Mediterranean dish here. Gross! Chicken Schnitzel, Bacon, Provolone Cheese, Mayo and Paprika - Ok so definitely not what you'd order if you were the least bit health conscious but when it tastes that good you just have to turn a blind eye. Mmmm So delicious. I add the side of rocket in the sandwich and drizzle some of their delicious balsamic glaze. I know a lot happening but trust me it works! 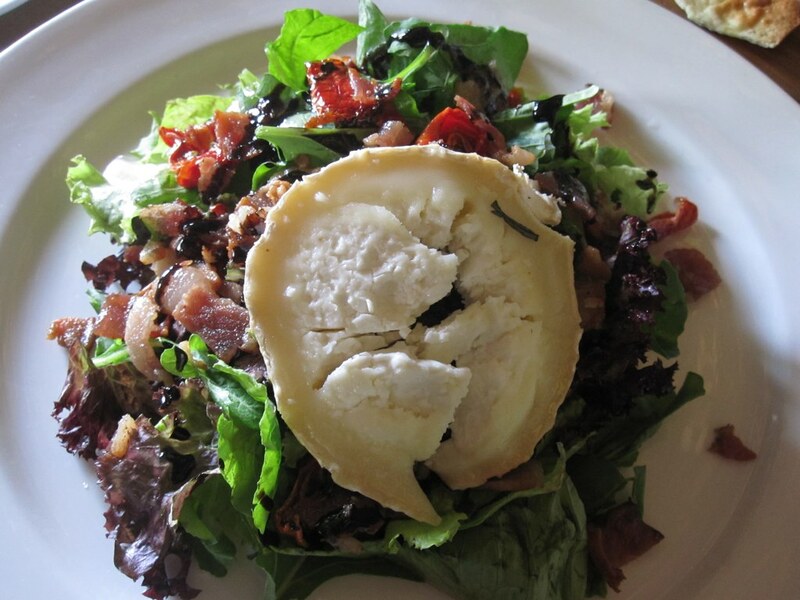 Mixed Green w/ French Goats Cheese, Balsamic Glaze and Sun Dried Tomatoes - This is my favourite salad here. It always tastes so good. If you see bacon, well that's because as usual I had bacon added. But this time its a vital addition, it really completes the dish. And I love their thick, sweet, balsamic glaze. So good! Orange Fennel Salad - with a lemony honey dressing - Great- Summer in a bowl. Semolina Crusted Fish- A nice light fish- crusted in semolina with some lemony olive oil dressing. 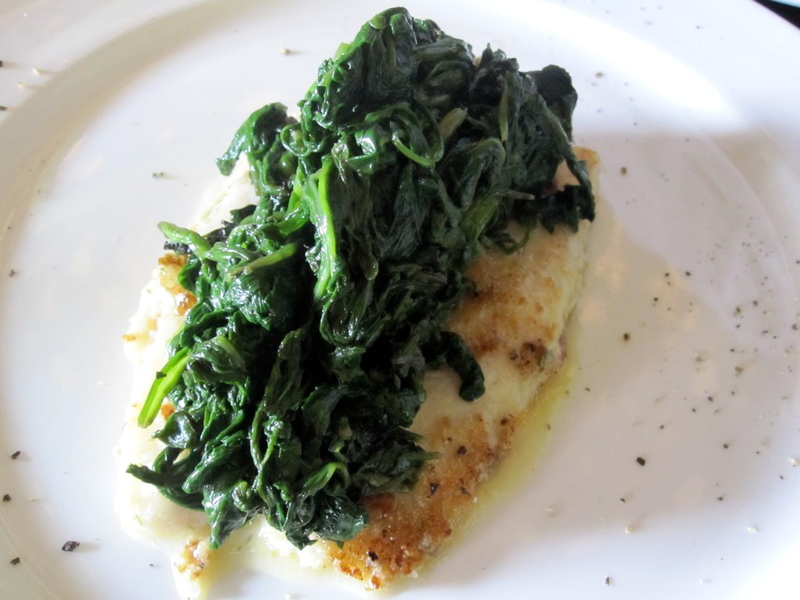 Accompanied with garlicky spinach. One of their classics. Good! Penne w/ Meat Ragu - Not bad not out standing either. 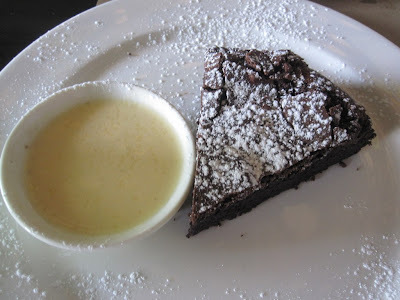 Desserts - They make some good desserts. 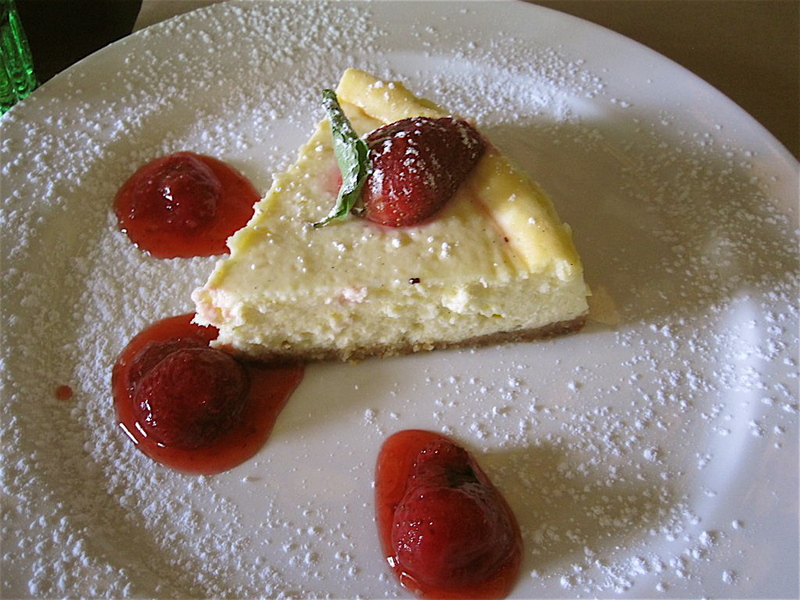 Some of the best Cheesecakes in town. 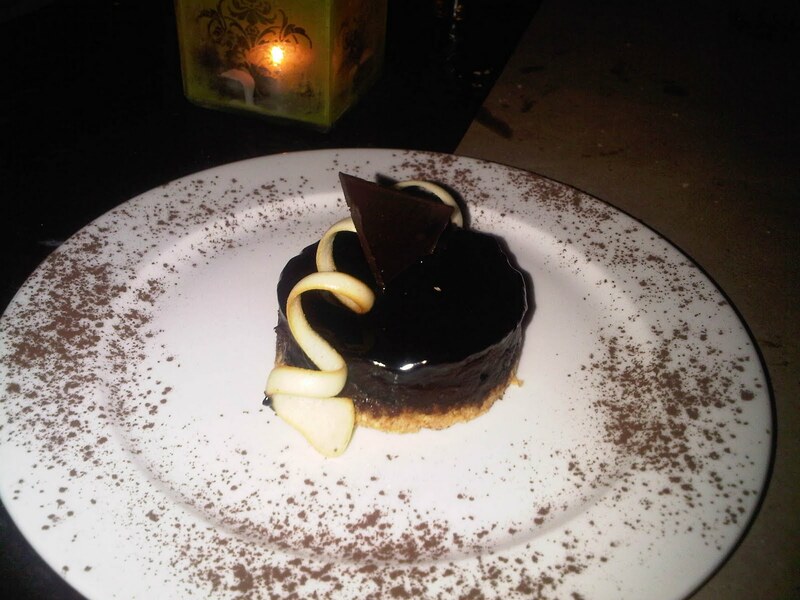 New York Cheese Cake is the bomb! 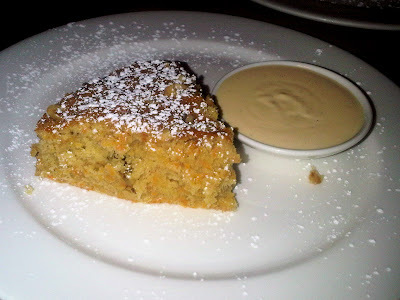 Carrot Cake - Super Duper!